Danger of Charismatic Leader. In my last post, I explored some of the difficulties which will arise with the weakening of a "legitimate" authority. At some point, no one will be alive who knew Rand personally. No one will be able to say, "I spent X amount of years with Rand; I'm therefore the foremost living expert on Rand's philosophy." Like the Protestant churches on Christendom, there will only be The Word; and whether for good or bad, The Word is not entirely unambiguous. 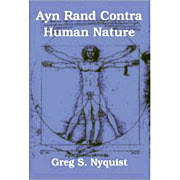 Most of Rand's philosophical writings are broad and abstract, crafted as facile rationalizations for various positions, rather than detailed and exhaustive analysis of specific problems. Many of her more topical essays are clearly dated, and will only become more so as time passes. Worse, Rand's own penchant for rationalizing preconceived conclusions set a bad example for her followers, who have become even worse in this regard, which in turn sets a bad example for future Objectivists. For way too many high ranking Objectivists, philosophy becomes a screen through which personal conflicts are fought and rationalized. Taking the longer, more distant, "objective" view is sneered at among some within the Objectivist community as constituting a false ideal of knowledge. The personal and subjective is conflated with the "objective," and followers of Rand, although ostensibly committed to an "objective" rationality, are in fact merely pursing their private, personal agendas. As long as Peikoff has been around, there existed someone who step in and decide which personal agendas would be regarded as "rational" and "objective," and which as mere whims. When Peikoff is gone, adjudication will require an authority figure (or figures). Since groups are naturally hierarchical (authority being necessary to run any organized effort), the task of leadership and authority would naturally fall to either the ARI board and/or ARI's director. Since committees don't always make good leaders (as individual members of the committee sometimes disagree), ARI's director will be the natural seat of authority, assuming the person occupying that position is a strong, rather than a weak, leader. I would contend that there exist institutional incentives in favor of ARI selecting strong, rather than weak leaders, for the ARI's directorship position. Weak leaders tend to be ineffective. In practical terms, a weak leader at the head of ARI could mean: (1) more unresolvable internal conflicts; (2) loss of fund-raising revenue; and (3) less influence among free market advocacy groups.